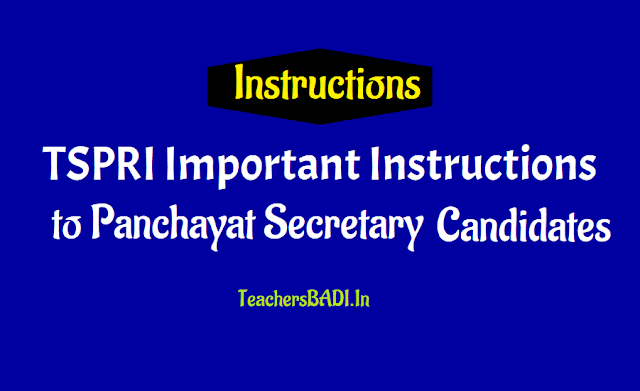 TSPRI Important Instructions have been issued for the candidates who are appearing the TS Junior Panchayat Secretary Exam 2018 which will be held on October 10, 2018. TSPRI Officials have released the hall tickets of Junior Panchayat Secretaries recruitment on October 3, 2018. The Download link of the Telangana Panchayat secretary hall ticket is available on the official website - tsprrecruitment.in. The candidates who have registered for the TS Panchayat Secretary Exam 2018 are advised to visit the official website to check and download the admit card / hall ticket. The TS Panchayat Secretary Exam 2018 is scheduled to be held on October 10, 2018. The JPS Candidates should read the instructions and follow it. a. Panchayat Secretary Exam Date: 10-10-2018, Date of written examination for Paper-I & Paper-II on 10th October 2018 (Wednesday). c. Valid identification card for Verification: "The Hall Ticket must be presented for verification along with at least one original (no photocopy or scanned copy) valid identification card (for example: Passport, PAN Card, Voter ID, Aadhaar-UID, Government Employer ID, and Driving License). Preferably, Aadhaar Card may be carried by the candidate." d. Hall Ticket validation: This Hall Ticket is valid only, if the candidate's photograph and signature images are legible. To ensure this, candidate is advised to get the printout of the Hall Ticket on A4 sized paper using a laser printer preferably on a colour photo printer. The candidate who does not have clear photograph or no photo on the Hall Ticket will have to bring two passport size photographs along with a written representation to Chief Superintendent in order to be permitted to appear for the test. This Hall Ticket is valid only, if the candidate's photograph and signature images are legible. To ensure this, candidate is advised to get the printout of the Hall Ticket on A4 sized paper using a laser printer preferably on a colour photo printer. The candidate who does not have clear photograph or no photo on the Hall Ticket will have to bring two passport size photographs along with a written representation to Chief Superintendent in order to be permitted to appear for the test. The candidate should use black or blue point pen only to darken the circles against the options provided in the OMR Answer Sheet. Before start answering, Question Paper Booklet Number should be written in the space provided. The appropriate circles have to be darkened for the Question Booklet Number. If the candidate fails to darken the correct Question Paper Booklet Number or leaves it blank, the OMR Answer Sheet may be liable for rejection/invalid. Use of Whitener or Eraser or Blade on OMR Answer Sheet will lead to invalidation/rejection of the OMR Answer Sheet. 7. Verified by Test Centre officials: Candidate will be permitted to appear for the examination, ONLY after their credentials are verified by Test Centre officials. You are provisionally admitted for Written Examination and if your Qualification is not equivalent to the prescribed qualification mentioned in the Notification when verified by the Expert Committee at the time of Certificate Verification, your candidature will be rejected. This Hall Ticket is issued to all the candidates who have applied without reference to verification of Qualification at this stage. Candidate will be subjected to frisking to ensure that they are not carrying any electronic or any other gadgets, mobile phone, Tablets, Pen drives, Bluetooth devices, Wrist Watch (both analog or digital), Calculator, Log Tables, Wallet, Purse, Notes, Charts, Loose Sheets or Recording Instruments strapped to their body or pockets. Calculators are not allowed. There may not be a guaranteed security facility for safe-keeping of valuable devices or personal belongings at the Test centre. The gates of the Test Centres for morning session will be opened by 9:00 A.M. and closed by 10.00 A.M. and for afternoon session opened by 02:00 P.M. and closed by 03: 00 P.M. No candidate will be allowed to enter the Test centre after closing the gate. Candidates are instructed not to wear shoes, Jewellery, Chains, studs and also wrist watches. The candidate should not leave the examination hall till the Examination time ends. The Department would be analyzing the responses of a candidate with other appeared candidates to detect patterns of similarity. If it is suspected that the responses have been shared and the scores obtained are not genuine/ valid, the Department reserves the right to cancel his/ her candidature and to invalidate the Answer Sheet. 14. The candidate must note that his/her admission to the examination is strictly provisional. The mere fact of Admission to the examination does not imply that his/her candidature has been finally cleared by the Department or that the entries made by the candidate in his/her application have been accepted by the Department as true and correct. 15. Candidates should note that in case of any discrepancy in the questions in Telugu/Urdu, because of ambiguity in translation, the English version of the question shall be treated as final. There will be 1/4 negative mark for every wrong answer. If the response to the Question is left blank without answering, there will be no penalty of negative mark for that question. The candidate is expected to behave in an orderly and disciplined manner while writing the examination. If any candidate takes away Answer Sheet of OMR based examination, his/her candidature will be rejected and in case of impersonation/ disorder/ misbehaviour during Examination, necessary F.I.R for this incident will be lodged with concerned Police Station, apart from disqualifying his/ her candidature. Candidate trying to use unfair means shall be disqualified from the selection. No correspondence whatsoever will be entertained from the candidates. The penal provisions of Act 25/97 published in the Telangana Gazette No. 130, Part-1.A. Extraordinary dated 01.06.2016 shall be invoked if malpractice and unfair means are noticed at any stage of recruitment, apart from debarring from future exams. Scribe may be permitted as per the Regulations. Candidates who are eligible for Scribe are required to approach the Office of the Commissioner, with relevant documents at least 5 days before the date of examination to get the permission. Candidate should return the OMR answer sheet and Question Paper Booklet before leaving the examination hall. Failure to do so will makehim/her liable for criminal action besides rejection of his/her candidature.